The heat of the South Dakota summer is behind us, making space for a calendar full of outdoor fall fun. Here in Rapid City and the nearby Black Hills, that means epic hiking, volksmarches, powwows, and Bierbörse. What’s Bierbörse? Read on, because you’re going to want to mark this one down as a long-weekend must. 1. Wake up to hot air balloons flying over the Hills. Back in 1934, the US Army Air Corps and the National Geographic Society chose a compact plot of the Black Hills as the ideal location for their manned high-altitude balloon launch. They called it Stratocamp, later renaming it the Stratobowl. 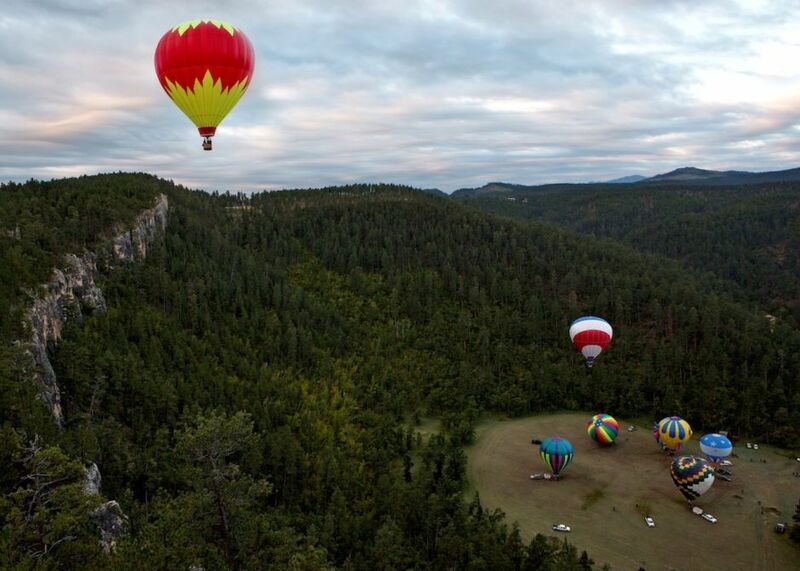 To celebrate and commemorate this colossal occasion, each year the Stratobowl Historic Hot Air Balloon Event is held on the exact site in Black Hills National Forest where that original balloon took flight decades ago. And it’s not just an over-and-done launch — you can spend the entire first weekend of September waking up to a South Dakota sky dotted with blazingly brilliant balloons. Balloonists meet bright and early each day at 5:45am to take to the air. But note that the best views can’t be had from the launch site itself — instead, make time to hike the 1.7-mile trail to the Stratobowl Rim Trail overlook. If you get a later start, you could also head over to Reptile Gardens just outside of Rapid City, which is where the balloons land if the wind is just right. 2. Drive through canyons draped in fall foliage. When the world-famous Sturgis Motorcycle Rally is over for the year, it’s time for the rest of us to cruise those epic canyon drives. Winding along beneath the ponderosa pine, quaking aspen, and Black Hills spruce is a special kind of detox, made even more memorable by the fall palette. Follow I-90 north out of Rapid City for a couple different scenic-drive options. For the first, take exit 32 to Sturgis. Drive along Forest Service Road 26 — aka Vanocker Canyon Road — toward the town of Nemo. Along the way, stop off for a hike on Centennial Trail, a tour of Wonderland Cave, or some horseback riding. Another über-impressive canyon drive is the Spearfish Canyon Scenic Byway. Keep going on I-90 to exit 14 or 10 outside of Spearfish. The 19-mile drive lined with limestone palisades is quintessential Black Hills. 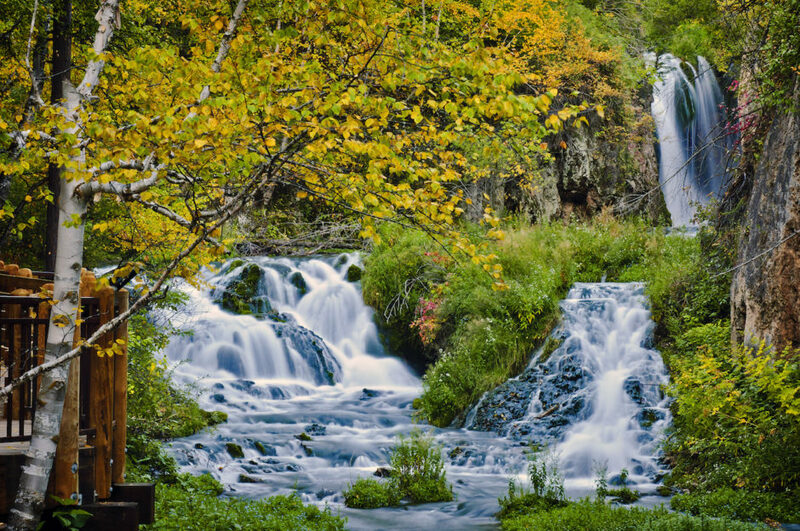 Continue until you reach Spearfish Creek for a stop-off at the enchanting Bridal Veil Falls and Roughlock Falls. After this, you’ll be Black Hills-converted. 3. 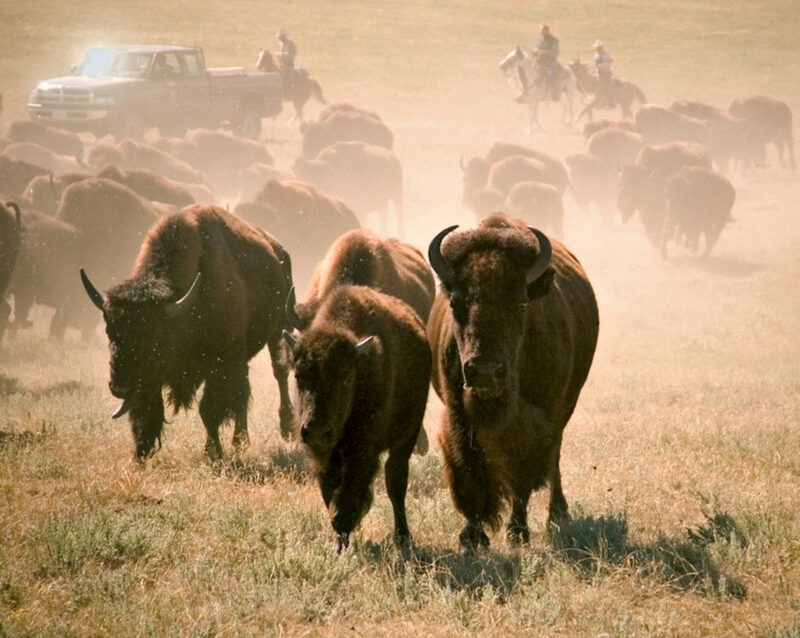 Catch the Buffalo Roundup at Custer State Park. For more than 50 years, the spectacular Custer State Park Buffalo Roundup has attracted thousands of spectators each September. Head over to the park early in the morning for the festivities. If you want a sure spot in the viewing area, get there before 6:15am, which is when they open parking. The actual viewing doesn’t start until 9:30am, so plan accordingly with a coffee thermos, picnic basket, and your favorite folding chair. The wait is oh-so worth it when you see, hear, and feel the stampede of 1,300-odd head of bison storm the landscape. It’s absolutely exhilarating, taking you way back to a different American era. 4. Trek the M-Hill and Skyline trails. Fall Saturdays can also be spent right in Rapid City — by dusting up the trails in Hanson-Larsen Memorial Park (aka M-Hill) and Skyline Wilderness Area. Both are located minutes from Downtown Rapid City (on either side of Rapid Creek). For a workout, hit the M-Hill trails, which feature about 1,000 feet of elevation change and plenty of switchbacks. Personally, I prefer the views you get at Skyline — check out the trail sections around Dinosaur Park and Stonewall Overlook. Wherever you go, bring plenty of water and sunscreen, as even on an autumn day these elevated trails get plenty of rays. 5. Conquer the Crazy Horse Volksmarch. “Volksmarch” is a German term describing a non-race fitness walk of five or 10 kilometers. At the giant mountain carving of a Native American war leader, it’s a culture, art, and history walk, too. The Crazy Horse Volksmarch is a twice-a-year event, and it’s possibly the coolest volksmarch to happen anywhere. The Fall Crazy Horse Volksmarch drew a record 15,000 volksmarchers last year, so plan on running into a few friends. There’s no advance registration, so if you’re a procrastinator, you’re still invited. The cost is $3 per person to participate. Parking is free and shuttle buses run the day of the march. Plan on spending at least two hours as you traverse the trails weaving around the carved mountain and up onto the outstretched arm itself — a view most visitors will never, ever get. 6. Attend the Black Hills PowWow. 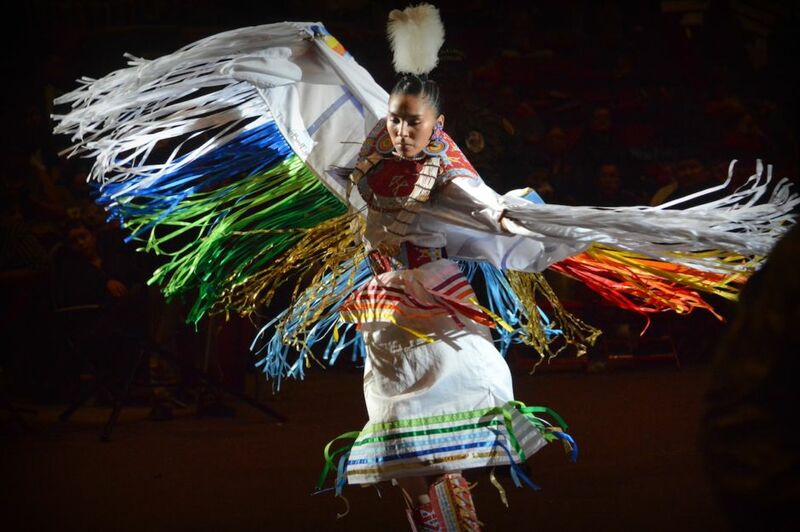 If you’re looking at a late fall weekend in Rapid City and the Black Hills, you’re in for a cultural explosion: the He Sapa Wacipi Na Oskate Black Hills PowWow. It’s a one-of-a-kind opportunity to explore the original South Dakota culture. And really, you can’t understand this region without considering the influence Native peoples have had on its history and modern development. But when you go to the Black Hills PowWow, forget “influences” — you’ll be fully immersed in the tribal way of life. A wacipi, or powwow, is a social gathering that brings together many tribes for traditional dancing, authentic food, and arts markets. Visitors are more than welcome to experience the Black Hills PowWow — just be considerate and follow tribal rules by dressing respectfully, not taking unauthorized photos/videos, and not disturbing any sacred offerings. German heritage around Rapid City runs as strong as a 57% Schorschbräu. They’re the largest ethnic group in the state, so if you get lucky and meet a Hutterite while out and about in Rapid City, be friendly and they might return in kind — most likely by inviting you to visit their colony. Hutterites speak German fluently and in many ways culturally resemble the better-known Amish, but they openly trade with non-community members, selling food items like smoked turkeys and freshly baked buns. 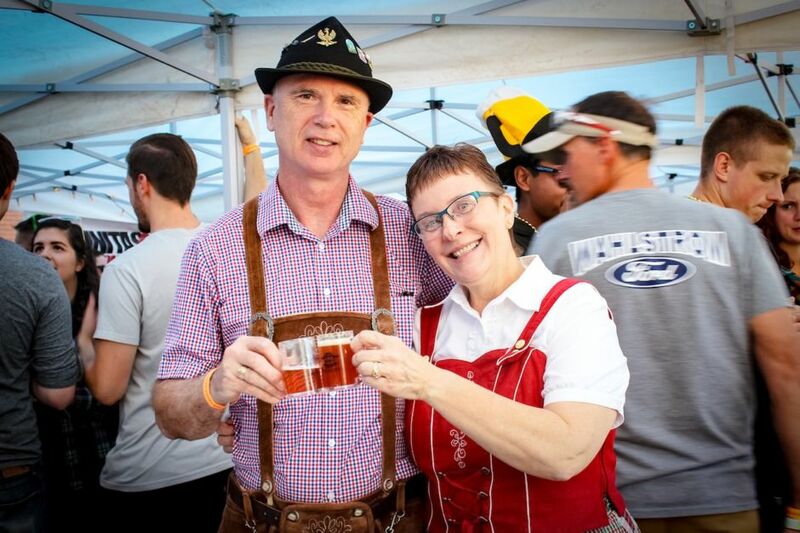 Even without the personal invitation, you can still sample this German heritage at Bierbörse, hosted at the Black Hills Beer Beverage Garden along Main Street Square. The annual Bierbörse brings together craft beer enthusiasts and, yep, polka dancers. A bierbörse is sort of like a beer stock exchange, where you pay for your beers according to the prices set by demand. If you’re drinking the beer everyone else hates, you score big with cheap pints! 8. Take advantage of NPS fee-free days. When you hang your hat in Rapid City, you’ve got Badlands National Park, Devils Tower National Monument, and Jewel Cave National Monument all within driving distance. And if you happen to be in town on specific days each year, you’ll get into these parks for free (though remember to donate if you’re able). Getting in by contribution to the third-longest cave in the world, an astounding isolated stone pillar, and to a landscape that looks like Mars? Yeah, that’s a deal. And don’t be fooled by Jewel Cave’s “monument” status. It’s just as epic as any national park, if not more so. Just like in the rest of Rapid City and the Black Hills, you need to up your expectations — because these places will blow your mind.